Mainstream Media (MSM) and some of their «smart» journalists were laughing at president Trump when he said he will cut taxes and bring back jobs and money. How in the world is he gonna do that with so much debt, they argued. Now, we know that president Trump was right. The U.S government receipts increased 7% YoY to 253 billion in October of 2018. Government revenues in the U.S reached an all-time high of 510447 USD Million in April of 2018, and the economy are growing faster and create more jobs than expected. It`s an economic boom. The U.S income tax revenue climbed from about 1 trillion in 2000 to 1,59 trillion US dollars in 2017, but we can already now see a major shift in the market. The forecast predicts an increase in income tax revenues up to about 2,92 trillion U.S dollars in 2028. Up nearly 100%. It seems like the booming economy will continue and the forecast predicts an increase in total receipts to reach about 4,39 trillion in 2023. Obama is often trying to take Trump`s cred for the economic boom, but the difference between Obama and Trump is the deficit. It climbed to $148 billion under Obama while it climbed to «only» $113 in fiscal 2018 under president Trump. So, the government did better on revenues and deficits under Trump than under Obama`s last year in office. The economy was sluggish under Obama were the federal revenues was barely increasing and the deficit increased. The real boom in the economy came with Trump`s tax cuts and all his business reforms. The Congress (on both sides) must be held responsible for the increase in deficit as they refuse to bring federal spending under control. The Republicans like to push down the taxes while the Dems like to keep them high. If the Dems were in charge, the taxes would have remained high on the cost of jobs and wage gains America now is enjoying. Would that be a better solution? Obama and Bernanke «printed» money after the financial crisis, but the economy was sluggish and the growth was never 2% under Obama. The recovery was very slow but it takes some time to turn the ship around. Obama and Trump should look upon themselves as one team; Team America and that`s red, white and blue. Thousands are protesting Trumps arrival in Europe. If you ask some of the protesters why they are protesting, they cant answer because they don`t really know. Whats strange to see is that nobody said something when dangerous dictators visited the U.K.
President Obama smashed all records and deported over 3 million immigrants in eight years. Did someone protest? Do someone know how many wars he started? Do someone know how many bombs he droped? Any protesters? All this from a man who received Nobel Peace Prize after only a few weeks at the White house. But people are protesting against Trump. Dump Trump, Trump is a Nazi, Trump is a fascist, Trump is a racist, Trump is a sexist, Trump is a baby, Vote him out, Impeach 45, Trump targets children – dont hold his dirty little hands, Trump stinks, Trump hurts women and children, Trojan Trump, Trump will die, Trump is homophobe, Nobody likes you, No Trump - No war. Trump - Not welcome. Choose love. Thats a few of the posters made by the protesters. What Trump has done with NATO is everything Obama dreamed of. So is it with North Korea`s dictator Kim Jong-un. He negotiated with him and made a deal. He is the first president to do so. He is making America great again. He is making the world a safer place. And people are protesting against him? A YouGov/ITV Tonight poll released on Thursday last week found there was «broad support» for Trump among Britons. Around 50 percent think the visit should go ahead, compared with 37 percent who think the visit should be canceled. 13 percent said they didn`t know. The poll is “noticeably higher than in previous YouGov polls that asked about a state rather than a working visit”, YouGov wrote in an analysis. On Monday, Mr Trump had a summit with Putin, and what is happening? 12 Russians indicted for election hacking. And what a timing. Mr Trump have repeatedly said that there was no collusion, and it seems like Robert Muller has a big problem. They have had 420 days of the Muller investigation with not one indictment connected to Russia and the Trump campaign. Its all smoke and mirrors. The 12 spies were spying, and thats their job. MSM said the summit with Putin was unsuccessful and that`s the opposite of what Putin said. Former assistant Secretary of State Robert Charles said the summit with Russian President Vladimir Putin was a success. Trump made history. Again. People in France are at a very critical moment as they need to vote for a pro-European liberal or a far-right challenger. Voters in France will not only vote for France`s future but also for its place in the European Union. 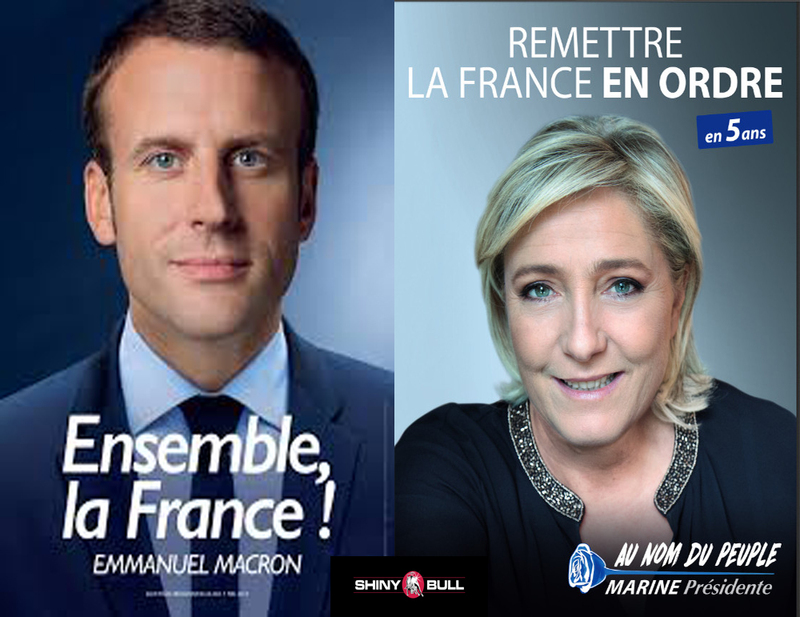 Whats so special about this election is that the Socialist party and the center-right that have run France since the 1950s is out of the game with their old models. No matter what the winner is, the new President of France will have an agenda for change. 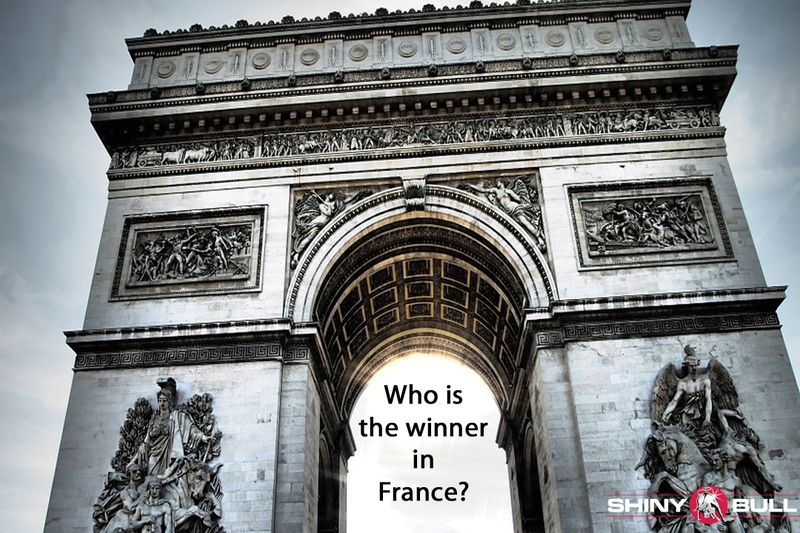 So, who is the next President of France? Wow! That was heavy stuff. «War declared» was also the headline in front of the newspaper in France earlier this week, and that was a message from Ms. Le Pen. There is no doubt; there is a war out there. The globalists vs The Populists. Its a Populist wave in Europe, but we saw in Netherland that the Populists are still a minority. People in Netherland didnt want them. The latest poll in France is telling us that Macron will win by 62% which is a big victory. But its not as good as Jacques Chiracs victory in 2002. He won 82,2% of the vote against the far-right candidate Jean-Marie Le Pen, which is the father of Marine Le Pen. Chirac`s internal policies initially included lower tax rates, the removal of price control, strong punishment for crime and terrorism, and business privatization. After pursuing these policies as Prime Minister in 1986 – 1988, he changed his method. He argued for more socially responsible economic policies, and he was elected in 1995 after campaigning on a platform of healing the “social rift” (fracture sociale). Then, Chiracs economic policies, based on dirigisme, state-directed ideals, stood in opposition to the laissez-faire policies of the United Kingdom, which Chirac famously described as "Anglo-Saxon ultraliberalism". Chiracs religion is Roman Catholicism just like Emmanuel Macron. There is a war going on and some of the weapons is «fake news». During the heated and sometimes vicious TV debate, Le Pen told Macron she hoped “we will not find out that you have an offshore account in the Bahamas”. That was a reference to documents circulating on the internet that linked Macron to a Caribbean bank and was easily identifiable as forgeries. Macron swiftly rejected the comment as «defamation». Paris prosecutors have launched a preliminary investigation into whether the fake news was being used to influence Sunday`s election runoff. Are we facing the same tactic as we saw during the American election? “Macron came to Greeces aid during our crisis. The left should back him, Yanis Varoufakis said. Former President Obama said: «Im not planning to get involved in many elections now that I don`t have to run for office again, but the French election is very important to the future of France and the values that we care so much about”. I look forward to Sunday. People in France are tired of their status-quo and want a change. This is clearly seen in this year’s election where two outsider candidates are in the final. It is the same frustration in France as it is in the U.S. People try to vote for different candidates than ordinary politicians. They voted for Obama because they wanted a change. People were looking for hope, and Obama must have done something right. Under his administration, the unemployment rate declined from about 10 to today`s 4,5 percent. Can the next President in France do the same? In my last article I wrote about Macron who said he wants to re-forge France`s politics, culture, and ideology. If Macron is the next President, he has a heavy job to do. France`s unemployment rate reached an all-time high in the first quarter of 1997. It peaked at 10,70 percent. But the unemployment rate is still very high and fell slightly to 10 percent in December last year. Frances unemployment rate of the population aged 15-64 years stood at 64,7 percent in December quarter last year. Its even more shocking to see that their record low is 7,20 percent in the first quarter of 2008. Its a revolution going on, but France has seen that many times before. The biggest one happened in 1789 until 1799, and Its very interesting to see what the triggers are. Historians widely regard the Revolution at that time as one of the most important events in human history. The causes of the French Revolution are complex, but following the seven years war and the American Revolution War, the French government was deeply in debt and attempted to restore its financial status through unpopular taxation schemes. Historians have pointed many events and factors within the Ancien Regime that led to the Revolution. Rising social and economic inequality, new political ideas emerging from the Enlightenment, economic mismanagement, environmental factors leading to agricultural failure, unmanageable national debt, and political mismanagement on the part of King Louis XVI who was executed. Louis XVI ascended to the throne in the middle of a financial crisis in which the state was faced with a budget deficit and was nearing bankruptcy. This was due in part to France`s costly involvements in the Seven Years War and later the American Revolution. In May 1776, finance minister Turgot was dismissed, after failing to enact reforms. A year later, Jacques Necker realized that the country`s extremely regressive tax system subjected the lower classes to a heavy burden. He argued that the country could not be taxed higher; that tax exemptions for the nobility and clergy must be reduced, and proposed that borrowing more money would solve the country`s fiscal shortages. Exactly the same pattern can be seen now. France has never had so much debt. France`s debt reached an all-time of 96 percent last year. Demands for change were formulated in terms of Enlightenment ideals and contributed to the convocation of the Estates-General in May 1789. The first year of the Revolution saw members of the Third Estated taking control, the assault on the Bastille in July. A central event of the first stage was the abolition of feudalism and the old rules and privileges left over from the Ancien Regime. The outcome of the Revolution was the establishment of a secular and democratic republic that became increasingly authoritarian and militaristic. It was a radical change based on liberalism and other enlightenment principles. Furthermore, we saw a rise of Napoleon Bonaparte with armed conflicts with other European countries. Napoleon became the hero of the Revolution through his popular military campaigns, went on to establish the Consulate and later the First Empire, setting the stage for a wider array of global conflicts in the Napoleonic Wars. The dictatorship imposed by the Committee of Public Safety during the Reign of Terror, from 1793 until 1794, established price controls on food and other items, abolished slavery in French colonies abroad, dechristianized society through the creation of a new calendar and the expulsion of religious figures, and secured the borders of the new republic from its enemies. A fundamental document of the French Revolution and in the history of human and civil rights is the Declaration of the Rights of Man and of the Citizen passed by France`s National Constituent Assembly in August 1789. The Declaration was directly influenced by Thomas Jefferson, working with General Lafayette, who introduced it. Influenced also by the doctrine of «natural right», the rights of man are held to be universal; valid at all times and in every place, pertaining to human nature itself. It became the basis for a nation of free individuals protected by the law. 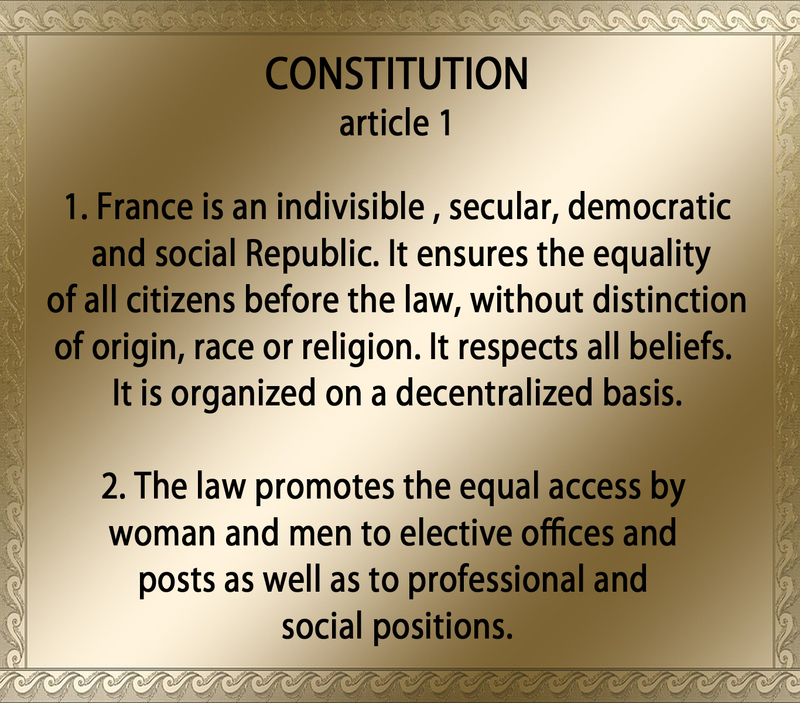 It is included in the preamble of the constitutions of both the Fourth French Republic (1946) and Fifth Republic (1958) and is still current. Inspired in part by the American Revolution, and also by the Enlightenment philosophers, the Declaration was a core statement of the values of the French Revolution and had a major impact on the development of freedom and democracy in Europe and worldwide. The modern era has unfolded in the shadow of the French Revolution, and the values and institutions of the Revolution dominate French politics to this day. Hundreds of years later, it`s interesting to see the same demand for change and hope. They executed the King at that time. Now, people are voting for non-politicians, are against the establishment and humiliate modern party politics of left and right. Macron knows that and once said, the system «has ceased to protect those it should protect». Don`t forget The Declaration`s article II: The goal of any political association is the conservation of the natural and imprescriptible rights of man. These are liberty, property, safety and resistance against oppression. The role of government is to recognize and secure these rights. There is a lot of fish, oil and gas in The South China Sea, but who are the real owner of the sea? China has claimed for years that about 90% of the South China Sea is their own territory. A document from 1940 stated that the sea is China`s. China and The Association of Southeast Asian Nations (ASEAN) agreed to start negotiating with each other before any move in 2001. China want the territory and have started to build islands on the sea and claiming them as their own. They can do that because they have one simple strategy; ignore the law. People with Asian trade interest doesn`t like that. Neither do Indonesia, Brunei, Philippines, Malaysia and Vietnam. Investors in that area should consider to get out as soon as possible. The South China Sea is a marginal sea that is part of the Pacific Ocean, encompassing an area from the Singapore and Malacca Straits to the Strait of Taiwan of around 3,500,000 square kilometers (1,400,000 sq mi). The area`s importance largely results from one-third of the world`s shipping transiting through its waters, and that it is believed to hold oil and gas reserves beneath its seabed. The sea and its mostly uninhabited islands are subject to competing claims of sovereignty by several countries. South China Sea is the dominant term used in English for the sea, and the name in most European languages is equivalent, but it is sometimes called by different names in China`s neighboring countries, often reflecting historical claims to hegemony over the sea. The English name is a result of early European interest in the sea as a route from Europe and South Asia to the trading opportunities of China. In the sixteenth century Portuguese sailors called it the China Sea (Mar da China). The majority of the sea came under Japanese naval control during World War II following the military acquisition of many surrounding South East Asian territories in 1941. The South China Sea contains over 250 small islands, atolls, cays, shoals, reefs and sandbars. The region has proven oil reserves of around 1,2 km3 (7,7 billion barrels) with an estimate of 4,5 km 3 (28 billion barrels) in total. Natural gas reserves are estimated to total around 7,500 km3 (266 trillion cubic feet). A 2013 report by the U.S Energy Information Administration raised the total estimated oil reserves to 11 billion barrels. In 2014 China began to drill for oil in waters disputed with Vietnam. 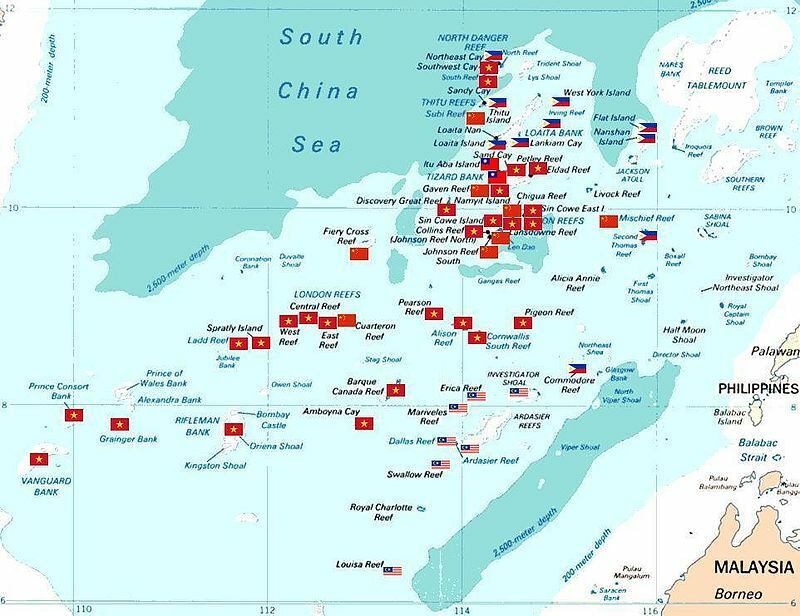 Several countries have made competing territorial claims over the South China Sea. Such disputes have been regarded as Asia`s most potentially dangerous point of conflict. Both, People`s Republic of China (PRC) and the Republic of China (ROC, commonly known as Taiwan) claim almost the entire body as their own, demarcating their claims within what is known as the nine-dotted line, which claims overlap with virtually every other country in the region. China and Vietnam have both been vigorous in prosecuting their claims. 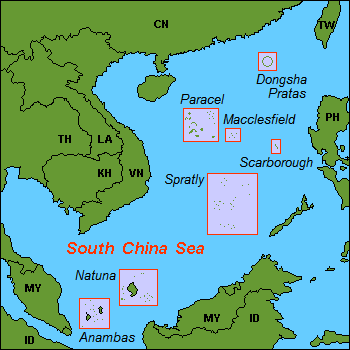 China (various governments) and South Vietnam each controlled part of the Paracel Island before 1974. A brief conflict in 1974 resulted in 17 soldiers being killed, and China has controlled the whole of Paracel since then. Seventy Vietnamese sailors were killed just south of Chigua Reef in March 1988. In July 2010, US Secretary of State Hillary Clinton called for the Peoples Republic of China to resolve the territorial dispute. China responded by demanding the US keep out of the issue. In January 2013, The Philippines government said it will take China to a UN tribunal under the auspices of the United Nations Convention on the Law of the Sea, to challenge its claims in the South China Sea. In May 2014, China established an oil rig near the Paracel Islands, leading to multiple incidents between Vietnamese and Chinese ships. Now, China has started building two military air strips on Subi Reef and Fiery Cross Reef. «China has convinced itself that it is the rightful owner of almost the entire sea» author Bill Hayton said, which is the author of the book The South China Sea. China want to be the owners of the islands because that will be the first step of owning 1,4 million square miles of sea, which is full of fish, oil and gas. The value of the natural resources in the sea gives the potential for disagreement and a conflict over territory in the South China Sea. International Law under the United Nations Convention of the Law of the Sea, says a country can only own an area of a sea if it owns the land adjacent to it. A country that owns an island can claims 12 nautical miles of seabed around it, and has the rights to the resources (but not the territory) up to 200 nautical miles around it. The Bush administration didn`t do much, but Obama was forced to take a stronger stance on the contested territory last friday. The Pentagon is discussing sending warships in the region. Investments in the South China Sea are at risk. Disclaimer: The views expressed in this article are those of the author and may not reflect those of Shiny bull. The author has made every effort to ensure accuracy of information provided; however, neither Shiny bull nor the author can guarantee such accuracy. This article is strictly for informational purposes only. It is not a solicitation to make any exchange in precious metal products, commodities, securities or other financial instruments. Shiny bull and the author of this article do not accept culpability for losses and/ or damages arising from the use of this publication. UA-63539824-1.